Lusaka Backpackers provides quality accommodation to the budget traveller in secure and relaxed surroundings. The rooms are spacious, clean and include linen, duvet, pillows and towels as well as free luggage storage. Facilities include a swimming pool, travel desk to book your trips and safaris, self catering kitchen and free internet access. 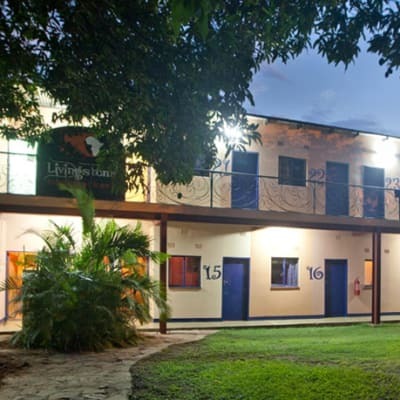 Livingstone Backpackers offers double en suite rooms with shower, double en suite with bath, double, dorms and camping. The lodge has a wide range of facilities that include a swimming pool, climbing wall, hot tub, self-catering kitchen with braai, restaurant, fully stocked bar, library, car park, dstv, 24 hour security and internet. Fawlty Towers lodge has 24 rooms which include deluxe suites, standard twin/double en-suite rooms, family rooms and dormitory accommodation. The activity center offers a variety of local activities, guaranteeing you the best deals. This is a gateway to the adventures surrounding the Victoria Falls. The restaurant at the hostel provides scrumptious meals with a mixture of both traditional and international favourites. A self catering kitchen is available for those who want to rustle something up for themselves. Assorted entertainment events that include theatrical appearances, lively parties and barbecues are constantly arranged. At Eureka Camping Park you will find comfortable accommodation and clean showers ideal for travelling backpackers. 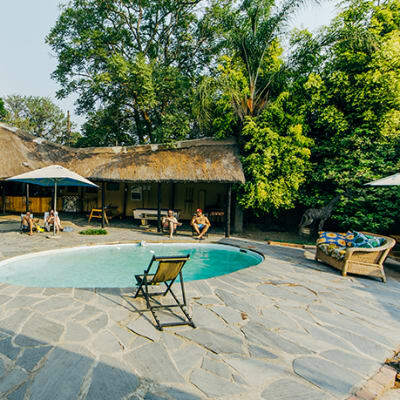 Set in a private game reserve, the park has a 26-bed bunkhouse, a cottage and simple 'A' frame grass thatched chalets. This is backpacker heaven - the kind of place for fun, friends and story-telling by camp fires!